Updated Dec. 4, 2018 at 12:10 p.m.
An overwhelming majority of the nearly 2,500 hotel workers who have been striking against seven Marriott hotels in San Francisco for the last two months have voted to ratify a contract that ends their walkout, capping an end to a labor dispute that touched cities across the country. Union officials announced Monday evening that the contract was ratified by a vote of 99.6 percent. The vote ends a strike by housekeepers, bartenders, bellmen and others represented by Unite Here Local 2 that began Oct. 4. "It really is a historic deal for these workers and our union," Unite Here Local 2 president Anand Singh said in an interview earlier in the day. Local 2 officials say the agreement, which was reached early Monday morning after a round of weekend talks, includes wage increases, improved job security protections and affordable health care coverage. "This hard-fought contract sets a new and transformative standard for San Francisco's hotel industry," Singh said. "During more than two months on strike, hotel workers' resolve never wavered and neither did the support and solidarity in our community. Now it's time for every hotel to follow Marriott's lead." In a brief statement, Marriott confirmed that it had reached an agreement and that "we look forward to welcoming our associates back to work." Now that the contract is ratified, the workers are expected to return to their jobs on Wednesday, according to Singh. Under the four-year deal, housekeepers would get a gradual $4-an-hour wage increase and workers who deal directly with guests will get a GPS-enabled panic button to get help if they feel unsafe, among other changes. UC Berkeley professor Harley Shaiken, who specializes in labor issues, says the contract is a win for Unite Here. "Wages, they went up. Benefits, particularly health care and pensions, improved. Workload was addressed in some new and effective ways," Shaiken said. The contract calls for workers who accuse a guest of sexual harassment to not have any contact with the guest. In cases that include credible reports of inappropriate sexual behavior, the hotel will evict a guest, according to Unite Here. "At a time when unions have been largely on the defensive, this really counts as a major victory," Shaiken said. The 60-day strike rallied the region's labor movement. The union received support from Mayor London Breed and several members of the Board of Supervisors, which held a special meeting in early November to hear the workers' stories. Breed and Supervisor Hillary Ronen applauded the deal Monday. 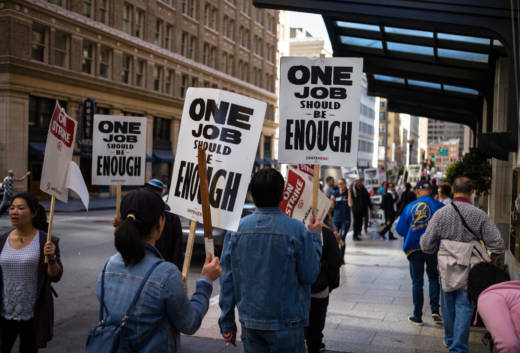 "In this time of rising inequality, it is crucial that our workers are able to earn a fair wage that allows them to live and support their families in the increasingly expensive Bay Area," Breed said in a statement. "This was a really important fight for the future of San Francisco and I'm delighted that the parties have reached a settlement," Ronen said in a text message through her spokeswoman, Carolyn Goossen. The company said during the walkout that it was disappointed its workers chose to strike and emphasized that the seven hotels would keep operating. Days before the supervisors' hearing, Marriott CEO Arne Sorenson criticized Unite Here, claiming it was more interested in coordinating a national labor action than in settling local contract issues at the bargaining table. Walkouts by Unite Here in San Jose, Oakland and other cities around the country ended in recent weeks while the San Francisco picketing continued. "I attribute that to the fact that San Francisco enjoys one of the highest, richest standards in a contract of any other city in this country. It's because of our past successes that our contract is so expensive," Singh said, adding that health care costs in the region are higher than other urban markets. The agreement ends strikes at the Courtyard by Marriott Downtown, the Marriott Marquis, the Marriott Union Square, the Palace Hotel, the St. Regis, the W and the Westin St. Francis. The walkout struck at the center of one of San Francisco's most lucrative industries: tourism. It not only made life inconvenient for some Marriott guests but it also led some organizations to postpone events at the company's hotels. Travel and hotel industry groups hailed the deal. "We're thankful that there is an announced settlement and that regular operations at the hotels involved will resume in the coming days," Kevin Carroll, executive director of the Hotel Council of San Francisco, said in a statement. "We are of course happy that a tentative agreement has been reached so that the hotels and the workers can move forward," said Laurie Armstrong Gossy, a spokeswoman for San Francisco Travel, in an email before the ratification vote. The dispute also triggered potential scrutiny from state workplace regulators. Several workers hired to replace hotel employees, who walked off the job in San Francisco, filed wage theft claims with the California Labor Commissioner's Office, alleging the company that hired them neglected to pay them thousands of dollars. The strike represents the largest hotel labor dispute in San Francisco since workers were locked out of more than a dozen hotels in 2004, part of a weeks-long conflict that at one point involved then-Mayor Gavin Newsom briefly joining a picket line. Singh said Unite Here Local 2 will now focus on setting strong contract language with other hotel companies in the city. "Because Marriott is the largest employer, it was important to engage them first, for them to set a pattern," he said. All of the union's contracts for major hotels in San Francisco with companies like Hilton, Hyatt and the Intercontinental Hotel Group (IHG) have expired, according to Singh. "The standard has been set. We expect other employers will step and do right by their workers," he said. A spokesman for Hyatt said the hotel company and Unite Here have already come to agreements in other markets this year. "Our colleagues are the heart of our business, and we respect their right to voice their opinions," said Michael D'Angelo, Hyatt vice president of labor relations. "Hyatt hotels in San Francisco, like those across the country, offer competitive wages and benefits to our colleagues." A spokesman for IHG said the company looks forward to "arriving at a mutually beneficial agreement" with Unite Here. Representatives for Hilton have yet to comment.